NHS South Sefton Clinical Commissioning Group (CCG) is inviting people to give their views and experiences about using and choosing different urgent care services when they need immediate or same day health advice or treatment. The commissioner, which plans and buys the majority of healthcare for south Sefton residents, is encouraging people to get involved as part of a review of ‘urgent care’ services. Urgent care includes services for physical and mental health problems ranging from pharmacies, GP practices, GP out of hours services, the NHS 111 phone line and website, walk-in centres, accident and emergency (A&E) departments and 999. Between mid-December 2018 and January 2019 the CCG is asking people to complete a questionnaire about these services for adults, children and young people. The information gathered will be used to help develop proposals for how urgent care could look in the future. Dr Craig Gillespie, GP and acting chair for NHS South Sefton CCG, said: “From our conversations with residents over the past few years we know that some find the current range of urgent care services difficult to choose from and confusing. Sometimes when people don’t know which service to choose they use accident and emergency, which puts extra pressure on hospitals, and means that people might have to wait longer for their treatment. The review will also consider how new NHS national guidelines for urgent care services and the introduction of ‘Urgent Treatment Centres’ might be put into place in south Sefton. 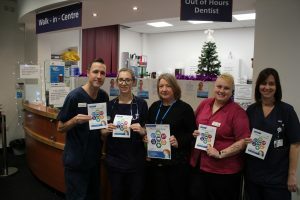 NHS South Sefton CCG is carrying out its review with partners across north Merseyside as patients often use urgent care services across this wider area. So, the CCG is also encouraging residents in Southport and Formby who use urgent care services in north Merseyside to complete a survey. Visit the NHS South Sefton CCG website to complete an online questionnaire or find out more www.southseftonccg.nhs.uk. Healthwatch Sefton is helping us to make the questionnaire available to anyone who may find it difficult to take part online. So, for help to complete a questionnaire, request a paper version, or for another format call Freephone 0800 206 1304, email info@healthwatchsefton.co.uk or text 07434 810 438. Can you make a difference to a vulnerable teenager’s life?